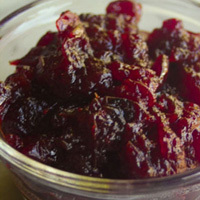 A jazzy cranberry sauce with a glissando of orange zest. Add all ingredients to a saucepan. Bring to a boil. Turn heat to a simmer and cook until sauce is deep red and has thickened. Serve warm or chill overnight until set.